The Road to Winterfell #21. Kennel Master doesn't care about challenge icons or stealth. Those requirements are only checked during the "normal way" to add characters to a challenge, during the"declare attackers" and "declare defenders" frameworks, whereas this ability is an action performed during an action window within a challenge. 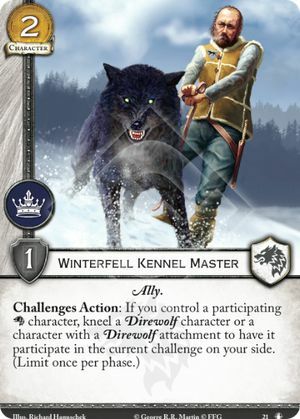 For example, Catelyn Stark with Lady (a Direwolf attachment) can be made to participate in a military challenge with the Kennel Master's ability (provided you already have a different participating Stark character). Likewise, if Catelyn is stealthed, she can still be added as a defender with the Kennel Master's ability.